"You can learn a lot about an era from its B-movie stars, and Peter Fonda, with his gigantic loopy shark-grin and his perma-shag and the weird Aryan intensity that always seemed to be bubbling just under the surface, was the perfect guy for the moment the hippie dream died. He was an icon thanks to Easy Rider, of course—a terrible movie that sidestepped its way into the canon by flattering a whole generation's frustrations. And he would've been an icon anyway, because he looked the way he looked and gave off that "privileged, oversexed stoner" vibe. But Fonda was a B-movie lifer, too, from The Wild Angels to Race With the Devil to Futureworld all the way through to the first Ghost Rider and, like, Boondock Saints II: All Saints Day. And Dirty Mary, Crazy Larry is a B-movie to the core. • The famous getaway car featured in the film is a 1969 Dodge Charger R/T with a 440 cubic inch V-8 engine. For muscle car buffs, the color of the Charger is Sublime Green. The same color for Plymouth was called Lime Light. The black stripe on the side of the car is NOT a "factory" racing stripe (rather one painted on by the crew), and the wheels are classic "American Racing" brand wheels. • Kris Kristofferson turned down the male lead. • Selected by Quentin Tarantino for the First Quentin Tarantino Film Fest in Austin, Texas, 1996. • A clip of the chase scene in which Mary says, "I think someone's knocking on the door," is played in the 1997 Quentin Tarantino film Jackie Brown in which Robert De Niro and Bridget Fonda are watching. Bridget Fonda is the daughter of Dirty Mary Crazy Larry star Peter Fonda. • Six Dodge Polara 440 V-8 police cars were purchased from the California Highway Patrol for use in the film. Two were 1973 models, the remaining 4 were 1972's. All were destroyed during various jumps, rollovers, and crashes. • Vic Morrow, playing 'Franklin', insisted on a one million dollar life insurance policy before he would film any scenes involving the helicopter, and said that if he wouldn't be insured, he would walk off the picture. His wish was granted, and he very reluctantly agreed to fly in the chopper. When asked why he wanted the policy, Morrow replied "I have always had a premonition that I'll be killed in a helicopter crash!" Of course, on July 23, 1982, Morrow was indeed killed, along with two children, when a helicopter was brought down by special effects explosions, right on top of them. • The collision with the train at the end of the film was accomplished by rigging an engineless Dodge Charger filled with explosives to a towing cable that was run underneath the train tracks (the cable and pulley are, in fact, visible in the film). The towing cable was hooked up to a pulley system, and then to the train, which pulled the Charger into it. The crash and explosion of the car were actually two separate shots: one was the actual collision with the train accompanied by a small explosion, and the second was a larger explosion of the wrecked Charger staged with the train passing in the background of the shot. Shut Up And Drive! will be screening this feature tonight, April 1, @ 9:00 pm ET. Click here to watch. Watching Vic Morrow in this film, it's so sad, knowing what happened. You know his daughter is Jennifer Jason Leigh? Yeah. He had it all going on. He was like Nick Nolte-Lite. We lost a hell of an actor in Vic Morrow. [21:34:36] this movie is sooooo bad. After Death Proof came out, we watched a ton of '70s muscle car chase movies on Netflix. 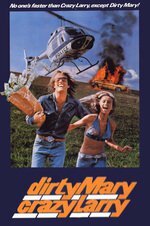 Dirty Mary, Crazy Larry was, for my money, the most enjoyable; the car chase was simply more pure fun to watch than Vanishing Point or the original Gone in 60 Seconds (though the latter had some great stunt driving). Trailer's better than the movie. Certainly it has better music. Gah, this was in my Netflix queue, but their license expired on Feb 1.